Fraser Valley – It is such a pain. You spends hundreds if not thousands of dollars to buy a new bike. You think you have it safely tucked away, and someone steals it. There goes your investment, and in many cases, there goes your form of transportation to and from work or school. For anyone on a tight budget (which is most of us) bike theft is costly. 7% of bike theft victims give up riding…period. The hassle to find your stolen bike is a pain and Police resources are thin. 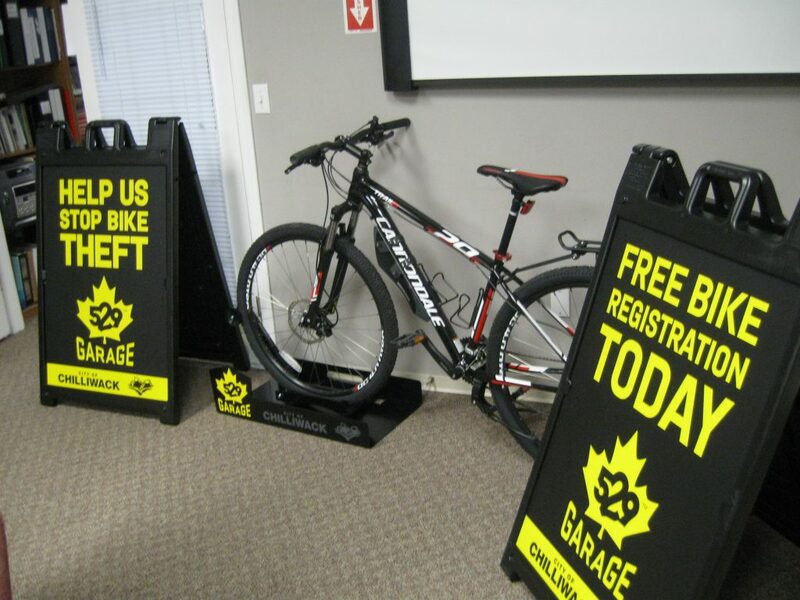 529 Garage is a new bike registration/theft prevention system that has come to Chilliwack and already taken hold in 13 other communities within BC. It has American roots with success in California and Portland, Oregon. In fact, a former employee of Xbox/Microsoft is behind the project and this has been endorsed by VPD – Vancouver Police (where 15,000 bikes are stolen yearly) and Chilliwack RCMP as well as Chilliwack City Councilor Jason Lum and Mayor Sharon Gaetz. You can find it through social media using #endbiketheft or going to the website here. It’s an on line registration that ties into a date base that local Police and bike shops are aware of. In Chilliwack- every bike shop is on board with the concept. In fact, 529 garage will be on display for your bike registration at the upcoming Public Safety Expo November 19 at the now abandoned Target store in Cottonwood Mall. As bike theft continues to rise across the Fraser Valley, a local organizing committee is joining forces with Portland based start-up – Project 529 Garage to help tackle the issue. Project 529 Garage is an award winning online bike registry and recovery application with a companion mobile phone app used to register and recover stolen bikes. The local committee is a partnership including members of the City of Chilliwack Public Safety Advisory, Chilliwack Community Policing, Chilliwack Restorative Justice, and the local cycling community. The group will officially begin registering bikes at a free Public Safety Fair in Chilliwack on November 19th with follow-up events already in the planning stages. Here are a number of quick-facts on the Project 529 Garage Program and bike theft in our communities. 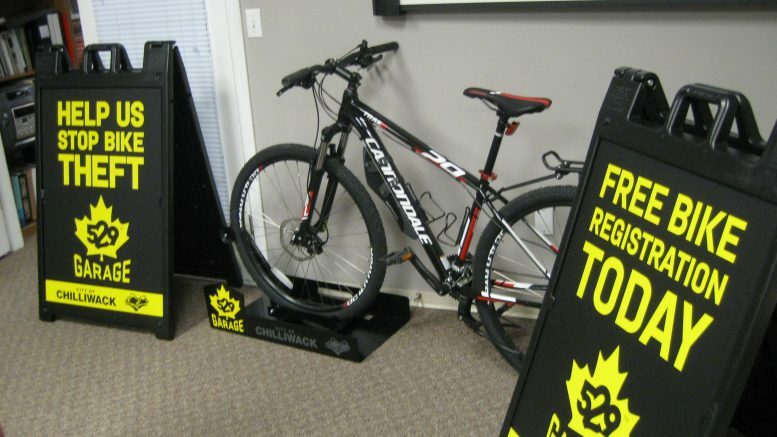 Over 50 bike shops are participating in the program including the 3 local shops in Chilliwack. The committee includes members from the RCMP, Fire Department, School District, Crown Counsel, the Downtown Business Improvement Association, BC Ambulance, ICBC, First Nations, the Chamber of Commerce, Restorative Justice, and includes representatives from Family Law, Corrections and Social Services. The committee is chaired by Councillor Jason Lum, and reports directly to Mayor and Council providing advice and recommendations on public safety issues, and current and emerging public safety trends. The committee regularly showcases the good work various groups and agencies are doing to combat crime in Chilliwack. Be the first to comment on "529 Garage: A Digital Bike Registration System That WORKS!"